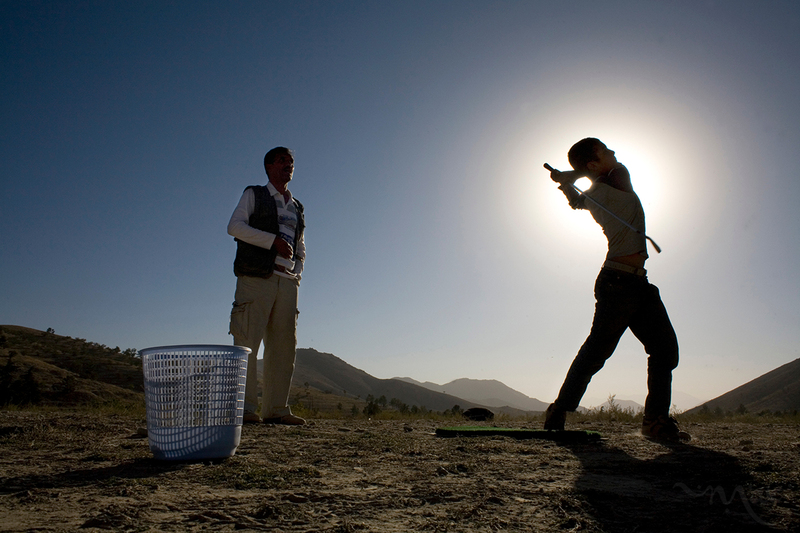 Muhammad Afzal Abdul, 48, left, watches the swing and form of a young student, right, at the Kabul Golf Club, Afghanistan's only course, on the western edge of Kabul on Friday Sept. 28, 2007. Abdul is the director of the golf course and resident golf pro. Having had his golf clubs and shop destroyed under the Communist regime, Abdul depends on donated golf clubs and balls to supply his players. After reopening in 2004, Abdul's hopes were high for money to develop his golf course, which is used mostly by foreign diplomats and aid workers. With larger concerns facing Afghanistan, like a resurgence of the Taliban and a failing economy, aid for a golf course appears long in coming.